The days are getting shorter and the temperatures are dropping. Butterflies will soon be a memory for us here in Pennsylvania. For the past couple of weeks we have spotted quite a few Monarch butterflies stopping at our goldenrod and asters to fuel up on nectar before flitting in the direction of the South. It is time for their migration to the mountains of Mexico. I am sad to see them leave, but I realize that they would never survive during our winters. So I marvel at their beauty and the fact that such small, delicate looking creatures can fly all the way to Mexico to their winter quarters. It will be a long time before we’ll see the first Monarch of the year here in the North. By that time, they will be several generations removed from their wintering ancestor. 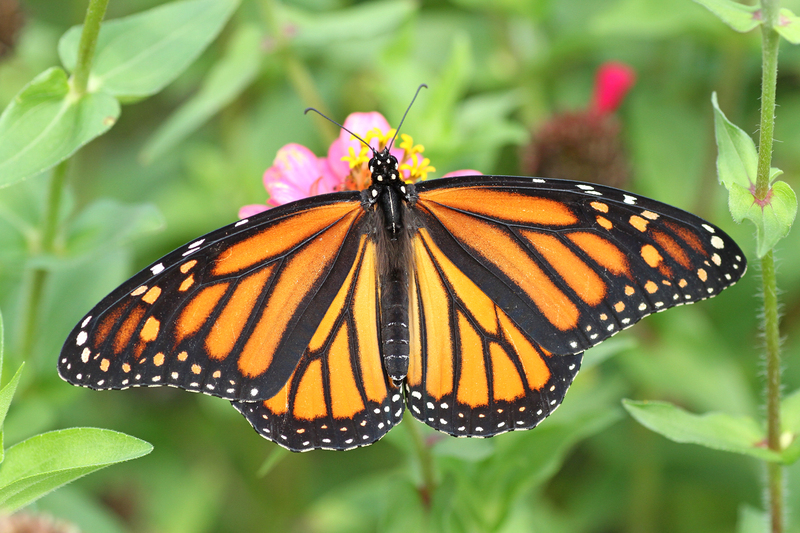 They need nectar along their journey, and milkweed plants to use as host plants for their eggs. If you want to ensure their survival, please plant milkweed plants in your yard. Last year, we added a red chokeberry (Aronia arbutifolia) ‘Brilliantissima’ cultivar to our front yard because of its beautiful fall color. I had also hoped that the birds would devour the red berries. At least, that was my plan until I learned that its berries have a very astringent taste. To protect it from the rabbits, we put a wire cage around it. Last week, I spotted two unfamiliar caterpillars on it. 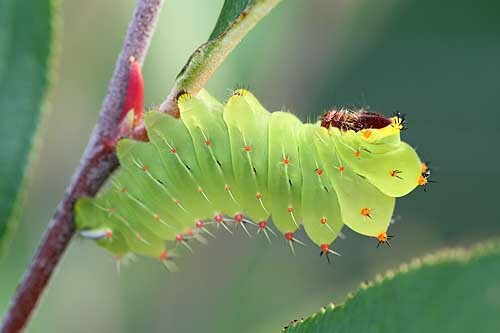 The green monster above is the larva of a Polyphemus Moth. 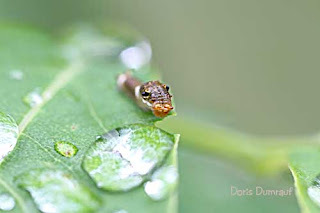 I watched it daily as it munched on the leaves of our little chokeberry, wondering whether there would be any leaves left to turn red in the fall. I need not worry anymore. Yesterday, I saw with dismay that another animal – most likely a deer – had eaten almost all ripe berries and for dessert, had chewed off quite a few little twigs. When left alone, the chokeberry gets to be about 8 feet tall and 4 feet wide. 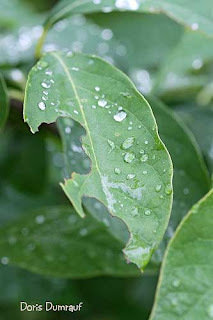 It can take dry to moist soil and sun and partial sun. Spring flowers are white and only last a few days. 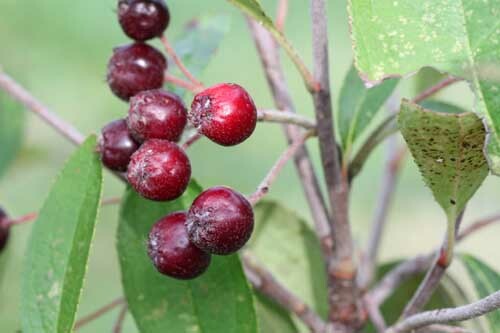 All in all, the chokeberry is a versatile addition to any native garden, provided that you don’t have deer in your neighborhood. 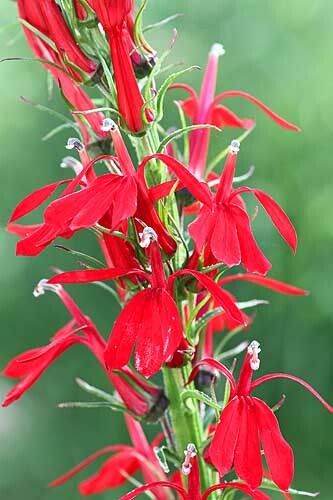 Part of the Bellflower family, the Cardinal flower stands out in any garden with its scarlet flowers. 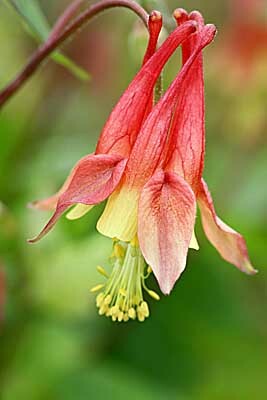 Its tubular flowers are a magnet for hummingbirds and bees alike. While it prefers moist meadows and wooded streamsides, it appears to be happy in our suburban garden with the aid of water. It began blooming in mid-July, making it one of the longer-blooming native plants in our yard. Yesterday morning, I photographed on a tiny island in North Park. A red mulberry tree had fallen over and onto the water. Nonetheless, it had a bounty of ripe berries that the birds gobbled up. I spotted Cedar Waxwings, American Robins, Goldfinches, Grey Catbirds, a Grackle, and even a swallow while they were eating. Birds are very tame there and did not mind my presence at all. It was a photographer’s dream. Feed them and they will come! Caterpillars are never in the open very long. They eat and then retreat under their leaf to avoid predators. Being prepared certainly helped me capture the moment. If you have a spicebush in your yard and it looks like its leaves get eaten, don’t despair. That is actually good news. 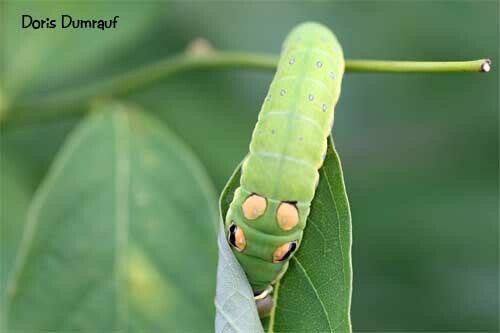 It means that a spicebush swallowtail laid its eggs under the leaves of the spicebush. As the caterpillar emerges from the egg it folds a leaf around it to protect it from predators. 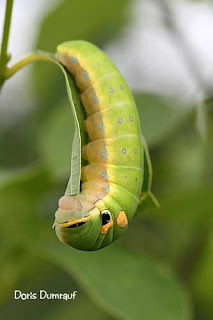 They feed on the leaves, which is why your spicebush might look like a giant insect took big bites out of it. Yesterday, I photographed a local garden for an assignment. 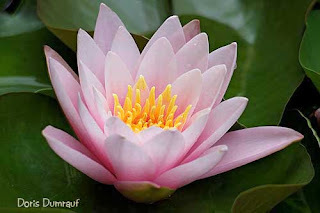 I was particularly attracted to the pond with its big pink lilies. While we have recently installed a pond in our yard and have put in two lily pots, they are nowhere near as big as these beauties were. Needless to say, I took almost more photos of the lilies than I took for the assignment. Every year is different in our garden and the only constant is change. 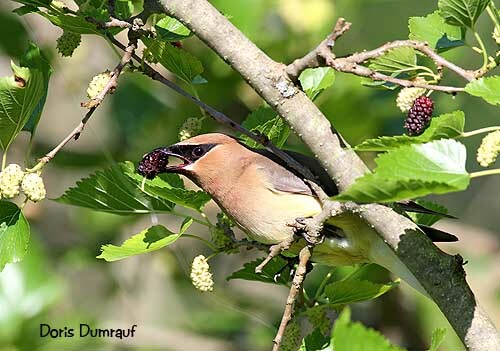 When our serviceberries ripened last year, a small flock of Cedar Waxwings decended on our yard to gobble them up. I was delighted to spot those beautiful birds in our garden and took some gorgeous photos of them. 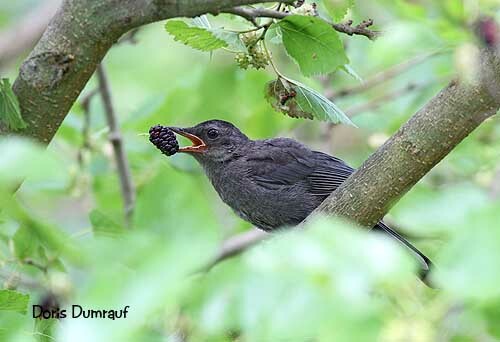 Their competition for the berries was a feisty robin who often chased them away. This year, I have not seen any waxwings. That means that the robins have the serviceberry to themselves. 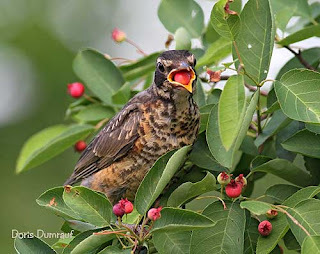 So instead of photographing silky waxwings I had to content with taking photos of a robin fledgling as it ripped the berries from the trees with little grace. More exciting was the mockingbird that visited the serviceberry one late evening, but its visit was brief. Spring blooms are short. Very short. If you blink, you’ll miss them. Such is the case with our serviceberry and our chokeberry. Therefore, I am happy that our wild columbine flowers are not only thriving, but they have been blooming for more than two weeks now. Yesterday, I received an added bonus as I watched a male ruby-throated hummingbird drinking from every flower of one of our numerous columbine plants. It was a thrill to behold. Wild Columbines not only provide a beautiful splash of color in the spring garden, but they are an important source of nectar for hummingbirds before any other flowers bloom. Spring brings many birds to our yard, especially to our feeders. 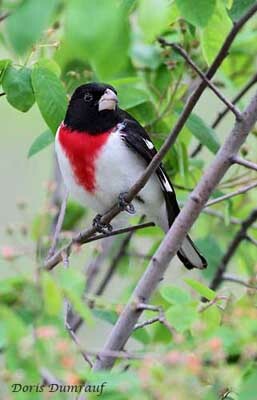 None of them are more colorful than the rose-breasted grosbeaks. This male beauty landed in our serviceberry and eyed me and my camera suspiciously before it decided it was safe to eat. We have also spotted our first female ruby-throated hummingbird at our wild columbine and our syrup feeder. The juncos have departed now and were replaced by a white-crowned sparrow, song sparrows, chipping sparrows, and Eastern towhees. We are busy planting for wildlife and have added two chokeberries, two blazing stars, an American plum, and a bee balm to our native garden. Plant it and they will come!